It was already hot and humid at 7:30 as I left the motel in Waynesboro. Not wanting to climb back up the mountain along Route 250 with the morning rush-hour traffic, I decided to head south along the valley, past Sherando Lake, and up Route 814 to the Blue Ridge Parkway. 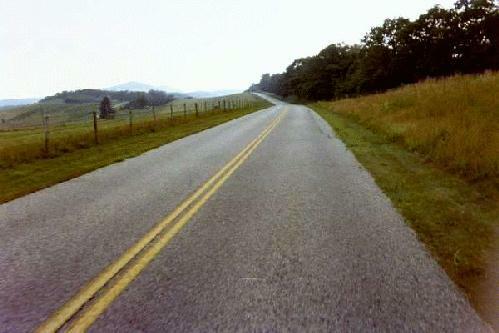 The road out of Waynesboro was typical for Virginia; four lanes, no shoulders. One truck driver , approaching from behind, apparently figured if he blew his horn long enough and loud enough, I would miraculously levitate myself and my bicycle out of his way. Since I am not yet able to perform miracles, I instead held my lane position, and prayed he wouldn't actually kill me in order to save 10 or 15 seconds on his trip. The road soon passed out of the industrial section of Waynesboro, and quickly became quite rural. Soon I was riding past a mixture of modest brick ranch-style homes, and some older 'shacks' in various stages of disrepair. Some of the houses even had chickens in the front yard. I'm definitely not in Connecticut anymore. As I got further south, the houses thinned out even more. I took a break at the turnoff for Sherando Lake, spending at least half an hour sitting on the bridge watching the water flow past in the stream below. Simple games for simple minds, I guess. Soon after getting back under way, the road started to climb; first gently, then more and more steeply. While walking one of the steeper sections, I was passed by three cyclists on racing bikes. I tried to convince them that climbing without a load on their bikes was cheating, and even offered to share some of my burden, but they only laughed and went on their unladen way. Eventually, the road topped out and I arrived at the intersection with the Blue Ridge Parkway. I sat here for perhaps five minutes, resting from the climb. Not a single car passed. The BRP felt quite different than the Skyline Drive had. Less busy. More serene. For the rest of the day, I had a grand time cycling along the Parkway. Traffic was incredibly light, and the road and surrounding countryside were beautiful. I soon noticed a line of thunderstorms moving along the eastern side of the Ridge. While trying not to focus my whole attention on the storm, I did decide it would be prudent to keep moving, and perhaps make it to the coffee shop at Whetstone Ridge before being caught in a lightning storm on top of the ridge. I made it with about 15 minutes to spare. Just as I was finishing up a plate of hotcakes, the storm hit. After my third cup of coffee (I'd be making a LOT of stops this afternoon! ), I moved outside to sit on the bench underneath the overhang and wait out the storm. As I sat on the porch, paperback book in hand but not really reading it, I noticed another cyclist coming up the Parkway northbound. He turned into the parking lot and pulled up under the eaves with me. It was immediately obvious that this guy had been on the road for a while. His gear had been pared to the bare essentials. In contrast to my heavily laden bike, with front and rear panniers, handlebar bag, and tent strapped across the rear rack, this cyclist had all of his gear stowed in two rear Ortleib bags. As we fell into conversation, I learned that he was from Germany, and was on the last leg of a cross-country trip. He had ridden across the southern tier of states, and was currently headed to New York to catch his flight back home. He seemed somewhat amused by the amount of gear I was carrying, but was too polite to say so outright. 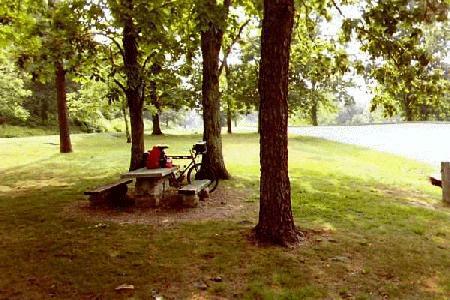 He did tell me that he traveled without a tent, and in inclement weather would spread his sleeping bag out in whatever shelter was available; often using the men's room at whatever campground he was staying in. He also did without a stove, and dined on cold foods exclusively. Since we were traveling in opposite directions, we were able to share much information about routes, facilities, etc. He also told me that people were much friendlier and more helpful in the west than here in the east. I felt compelled to warn him that as he continued north and approached New York, the people he met would become even less open and warm. Once the immediate rain storm had passed, we bade farewell and went our respective ways. Since the skies still looked threatening, I installed the rain covers on all of my panniers. I operate on the theory that if you make all of the appropriate sacrifices to the rain Gods and/or Goddesses, the chances of actually being rained on are drastically diminished. I guess my theory works, because I stayed dry for the entire afternoon. The Parkway continued to work its magic. Traffic remained sparse. The road passed through varied terrain. First climbing fairly gently up and down the wooded hillsides, then through rolling pastures with isolated farmhouses in the middle distance. Occasionally the Parkway passed over a tiny dirt road, which would appear oh-so-steeply up one side of the ridge, the disappear just as steeply down the other side. 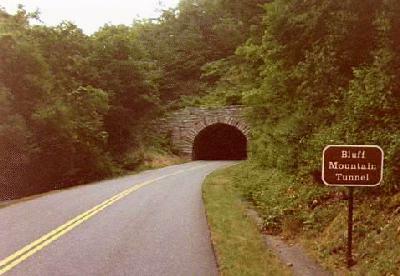 Finally, the last ten miles of today's ride was a long, gentle downhill, passing through the Bluff Mountain Tunnel, then following the course of Otter Creek down to Otter Creek Campground.